As widely expected the Federal Reserve voted unanimously to leave the fed funds target rate in the range 1.5-1.75%. The accompanying statement reports that the economy continues to expand at “a moderate rate”. It acknowledged a slight slowdown in consumer spending, but noted investment continued “to grow strongly” and the jobs market is “strong”. Meanwhile inflation measures have “moved close to 2 percent” with an emphasis placed once again on the fact the inflation target is “symmetric”. Consequently the Fed is of the view that economic risks remain “roughly balanced” and that conditions will evolve in a manner that warrants ongoing “gradual increases in the federal funds rate”. The dollar has weakened a touch and Treasury yields are fractionally lower, which may reflect a hint of disappointment that the Fed were not more upbeat on the economy and the threat of inflation. It could possibly be down to the re-inclusion of “symmetric” as a way of underlining the gradual approach to policy tightening - the Fed looked through temporary dips in inflation and therefore will look through temporary spikes. Either way the Fed were unlikely to be very bold given there is a long way to go until the June 13 FOMC meeting. Nonetheless, with Friday’s jobs report set to show US unemployment falling to 4% - a new 18 year low – and business surveys increasingly highlighting the problem of supply bottlenecks, we see growing upside risks to inflation. 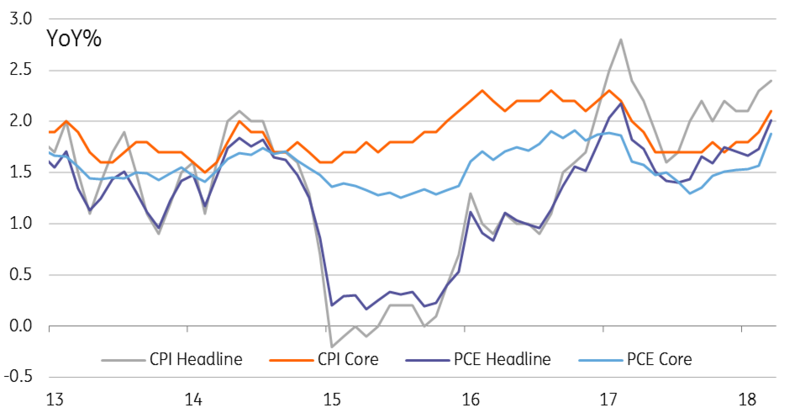 Indeed, next week’s CPI is set to tick higher and we see the real possibility of headline inflation reaching close to 3% in the summer and core inflation breaching 2.5%. Meanwhile the economy appears to have regained momentum following a soft run in January and February, which was probably a hangover from the hurricane rebuild/replace spending mini-boom in 4Q17. The combination of rising wages and employment together with huge tax cuts means the domestic demand story looks robust while the lagged effects of the softer dollar gives US exporters a competitive edge to benefit from stronger global demand. As such, we continue to see the balance of risks skewed towards a more aggressive Fed response to combat fears of economic overheating. We look for a June rate hike followed by two further 25bp moves in the second half of the year with the main threat to our view being an escalation of economically damaging trade tensions.